WEDDINC: First of all thank you so much for agreeing to an interview with Weddinc. We absolutely LOVE Astrophotography and everything about it. We’re here today with Robert Paetz, Astrophotographer with Robert Paetz Photography. Let’s start with a little about you. How did you get into Astrophotography originally and have you always been interested in the cosmos? ROBERT: I didn’t have a particular interest in the cosmos, but growing up, there were lots of camping trips with my family, and I have always enjoyed the outdoors. I love the feeling of awe and wonder when I look up into a dark sky full of stars. I had been already been reading a lot about Astrophotography by then and was proficient with off camera lighting. Giving it some thought suddenly made things click in my brain that it might just work. We are thankful to that first adventurous couple who took a risk on us when we told them to meet us by the vending machine at a desert motel at 2am and let us drive them into the darkness of Joshua Tree. 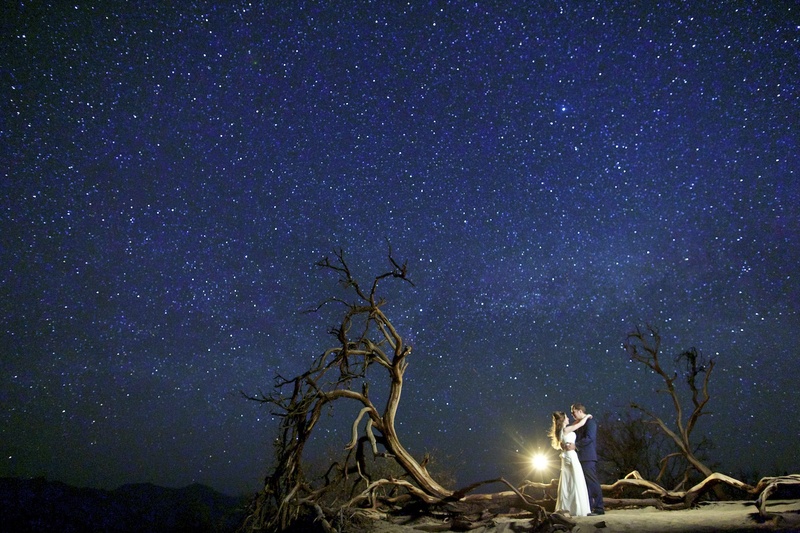 WEDDINC: Did you stumble upon shooting the Milky Way in the background of one of your shoots or did you set out to shoot it? ROBERT: At the beginning I wasn’t too aware of celestial movements. 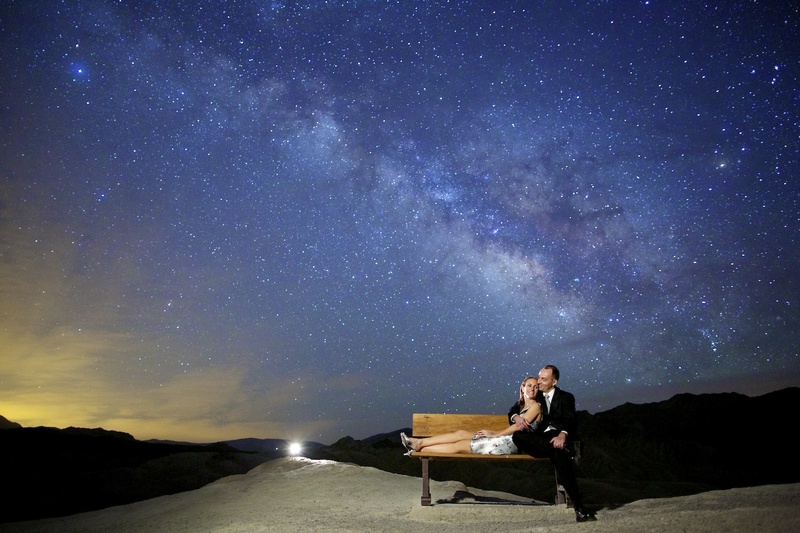 During the second shoot we did in Death Valley, the Milky Way rose over the background by glorious happenstance. Since then, I have taken time to learn a bit more about it and use an app called PhotoPills to help me track these. 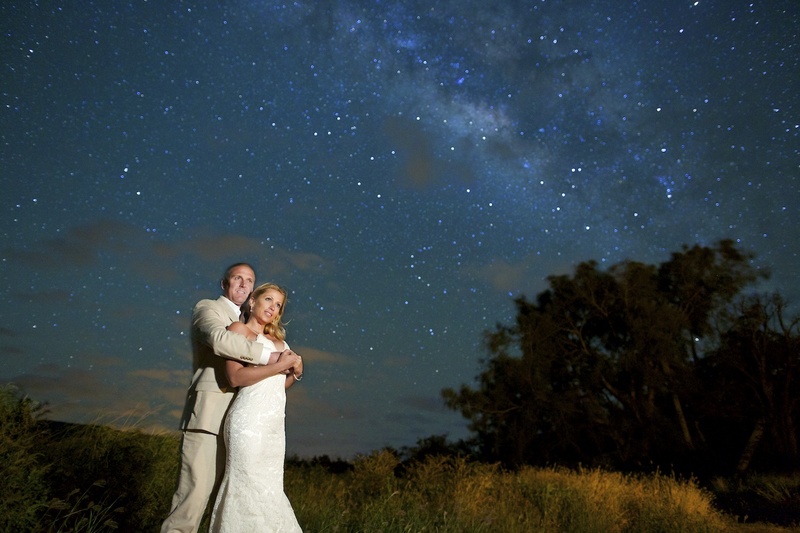 WEDDINC: What are the challenges you face when shooting the Milky Way or a star-lit night in a photo? ROBERT: They do involve a bit of planning as these can only be shot a few days before or a few days after a new moon and it needs to be photographed at least 100 miles from a major city to avoid light pollution ruining our view of the night skies. Secondly you need to worry about weather, that’s why the desert works the best: rain clouds blocking out the skies can be a real downer after everyone went to great distances to get out under the stars. Most importantly though, it’s about having amazing clients who will follow any crazy idea you may have, even when it comes to standing in the freezing desert wind in complete darkness while I rush around adjusting lighting, camera placement and a number of other technical things. I couldn’t do any of this without the trust of my clients. 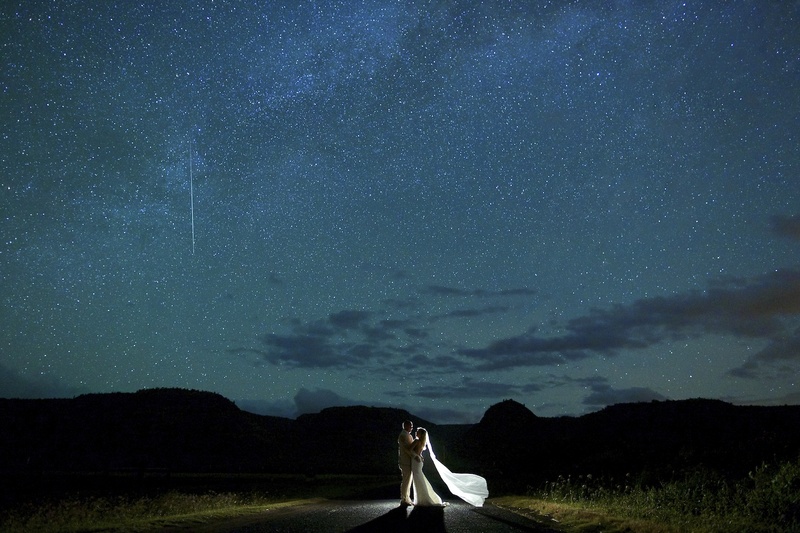 WEDDINC: How many times have you been able to capture a ‘lucky’ shooting star as in the photo above? 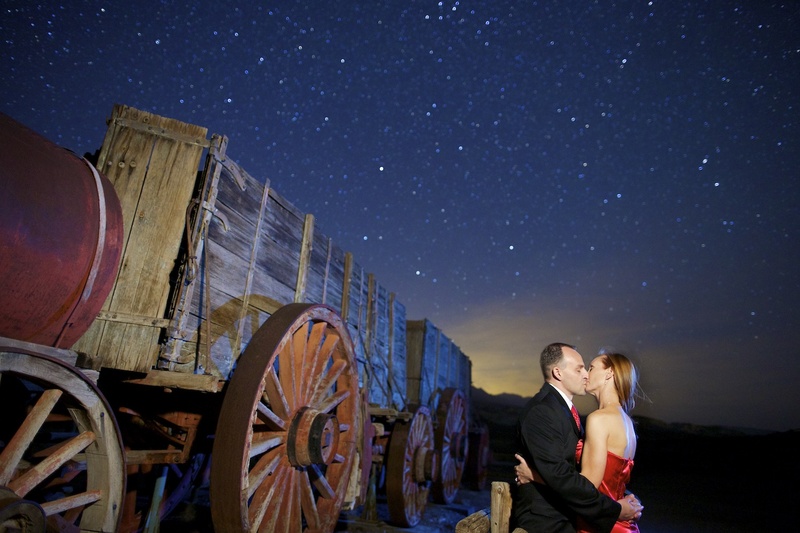 Would you say the couples in your photos with a shooting star have had any significant “luck” after the shoot? ROBERT: Surprisingly, shooting stars actually aren’t as rare as I once thought. 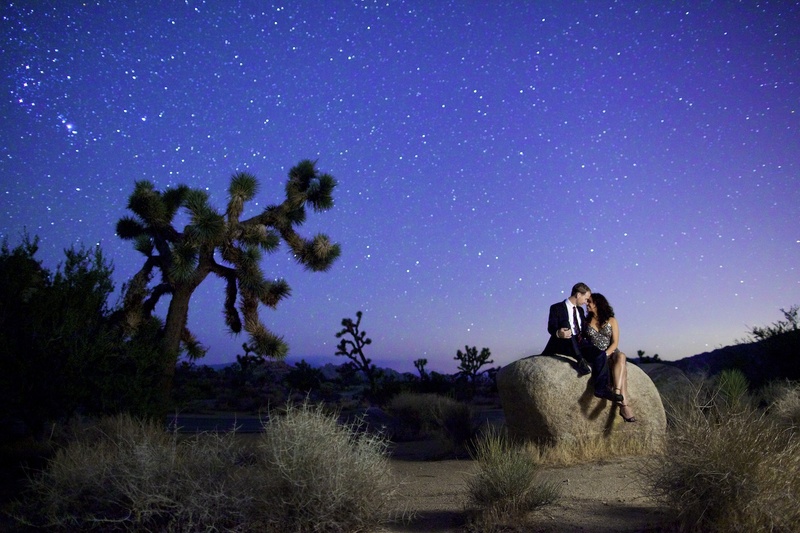 I think almost all the couples that have been out under the stars have seen at least a few. That said, the shooting stars work on their own schedule so it’s more sheer luck for one to end up in an image. 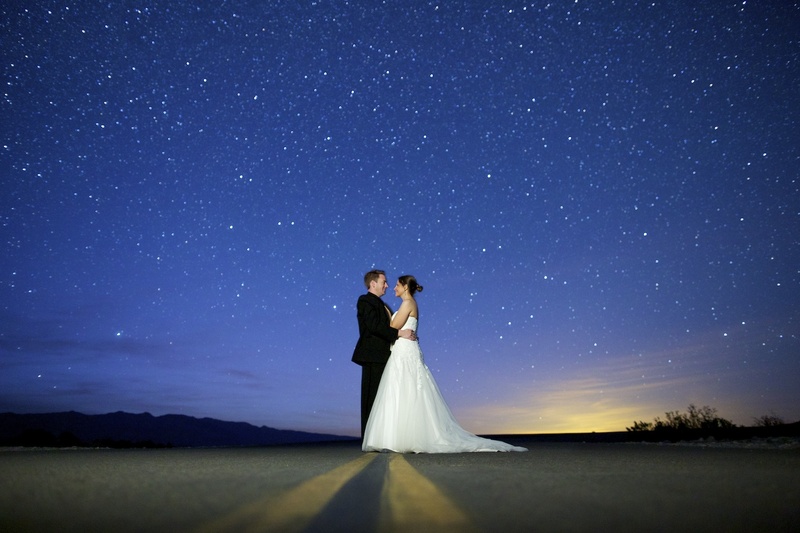 WEDDINC: How often do you get requests for Astrophotography and what’s your favorite location for a shoot? ROBERT: I get many of requests from couples interested in the process of making this happen, but once I educate people on the distance, scheduling restrictions, time and effort it will take for these images to happen (because of the many factors described above) it narrows it down to the most adventurous couples that end up under the skies with me. I don’t set a limit, but I shoot about 6 of these sessions a year. I do not have a favorite spot, because I am always on the look out for new locations, but most of the time I shoot in Death Valley or Joshua Tree. 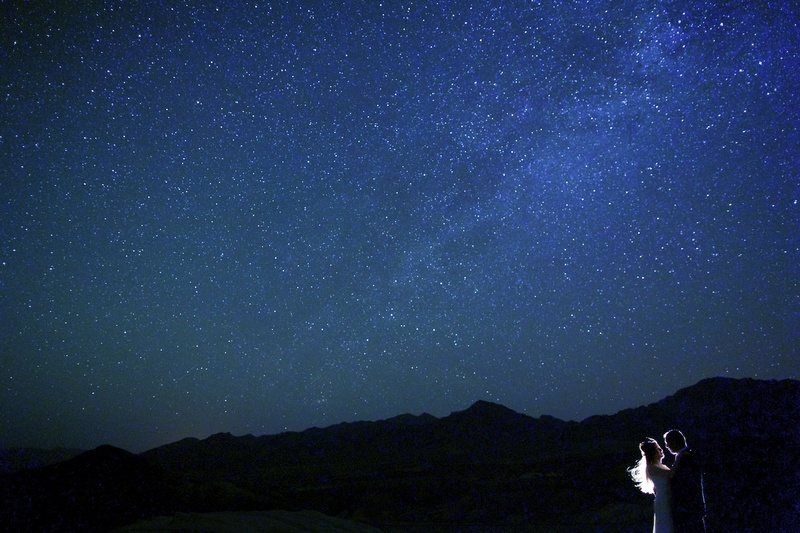 WEDDINC: What is a Meteor Shower? I borrowed that from Wikipedia, but essentially a meteor shower is LOTS of shooting star burning through the atmosphere in a short period of time. I’ve never photographed one, but I did spend a few hours watching the Perseids shower with my nieces who were equally spellbound. The Perseids shower is the most regular and happens from mid July to mid August each year and I would be thrilled if someone want’s to schedule a shoot around then in 2017! WEDDINC: For our photographer enthusiasts out there, what are some of the techniques you use to capture such beautiful skies? ROBERT: First and most importantly, check on the moon; before you get into anything else you want to make sure the moon is not in the sky before you set out to photograph the stars, otherwise you (and your camera) just won’t see all that much. Next, bring a flashlight, coat, food, extra water (and maybe a couple beers if you’re not working) – the Eagle Scout in me always tries to focus on the essentials and safety first. Once you are sure you are not going to get lost in the dark without any light or supplies, then remember to bring your tripod. From there, there are literally hundreds of online articles which would describe step-by-step processes to create amazing nighttime images. WEDDINC: If couples are nervous about doing the shoot what is your one trick to make them feel at ease in front of the camera? ROBERT: For my photography sessions I put the emphasis on having fun and relaxing. I carry on conversations while we shoot and do my best to keep things light-hearted. Most people are worried that they won’t know how to pose or how to be a model, but I always let them know that I will take care of all those details and they just need to focus on their partner. WEDDINC: What other types of photography do you do besides wedding photography and Astrophotography? ROBERT: Before I became seriously involved in wedding photography in 2010 I spent about 3 years traveling the globe and taking pictures. I’ve visited approximately 60 countries and I am currently planning to spend 5 weeks in Myanmar and Southeast Asia over the holidays and throughout January. My biggest regret about life in general is that there will never be enough time to see everything, and more importantly, try all the world’s food. WEDDINC: Have you been able to shoot the Aurora Borealis? ROBERT: I haven’t made it that far north in the middle of winter just yet, but if anyone out there is looking for an epic adventure, I am totally game to head for Iceland, Norway, Alaska, Finland or anywhere else near the Arctic Circle and create some astounding Aurora Borealis images for you. WEDDINC: Is there one shoot or one photograph that you are especially proud of? ROBERT: Photography for me is about constant growth and new challenges. Every time I reach an accomplishment or discover something new in my photography I try to raise the bar for myself. Sure, there are a couple images that gets me super excited about some aspect of photography, but they are not seen as an end point, more likely they are the beginning of something new that I can build on. When I look back over the millions of pictures I have taken over the last 12 years, it’s the images I didn’t create that keep pushing me onward. WEDDINC: What is next for you career wise? ROBERT: In 2017 I still plan to photograph weddings, but I also plan on shifting the direction of my photography career to include more travel images as well as documentation of various NGOs and volunteer causes around the world. As I get older I am looking to find ways to give back and telling worthwhile stories through photography seems the obvious way for me contribute. My goal is to start creating some unique images for great causes and projects that could be used to show the fascinating work being done, as well as to create striking visuals to raise awareness and much-needed funds.